I stayed here one night in the private room with an en-suite. We booked last minute as we were not feeling well and the hostel staff were accommodating and lovely. They were really caring and helpful. The room was clean, big and quiet, it was really lovely to stay there. Everyone in the hostel was nice and the staff let us have a late check out (for a fee) in order to help us with our illness despite the fact that this was not normally done. We loved Viva Escondido so much we ended up staying two weeks! The staff are awesome, the kitchen is amazing and the air con at night is an added bonus. It’s super close to the nicest beaches and it’s only 35 pesos to get into town if you want to party. Would highly recommend this hostel! Vivo Escondido became my boyfriends and i’s new little home - the staff were so friendly and inclusive, the hostel itself was really clean but also had heaps of character and Tommy the owner was so welcoming and flexible with us! It’s also in such a good position for good restaurants and it’s also really cheap to get a taxi down to Zicatela to surf or drink 😋 would 100% recommend! Great chill hostel. The people are both really laid back and really enthusiastic/helpful. The location is awesome! There are restaurants, beaches, and a convenience store all less than a 10 minute walk. We loved it. 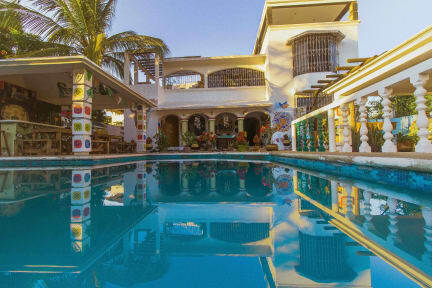 Nice vibe, very friendly, good pool perfect temperature, loved the art, communal areas, hammocks etc, good breakfast, large well stocked kitchen, everything very clean, 5 mins to some good restaurants. All in all a brilliant place to stay. Such a nice hostel, really chill and the staff were really friendly and welcoming. Pool was great and rooms were nice and big with large lockers. The hostel is located in a great area and overall I loved my stay! Would love to go back! It's a really nice place near one of the beaches. The hostel is not very big which I like. Nice garden with a pool and a bar to sit and relax. Kind staff. AC in the room was a big plus. I like the airconditioning in all the rooms and table tennis For me was the swimming pool no option. My hair gets green because of to much chlorine. refrigerator is overfull.